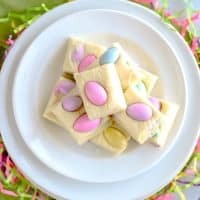 Easter white chocolate fudge is quick and easy to make with this microwave white fudge recipe! Only three ingredients and less than 5 minutes of active prep time are needed to create this festive no bake spring treat. Traditional fudge is made on the stove top by combining butter, sugar, milk and chocolate. And, yes, you most often enjoy fudge around Christmas time. Today we are changing things up and making an easy fudge in the microwave. 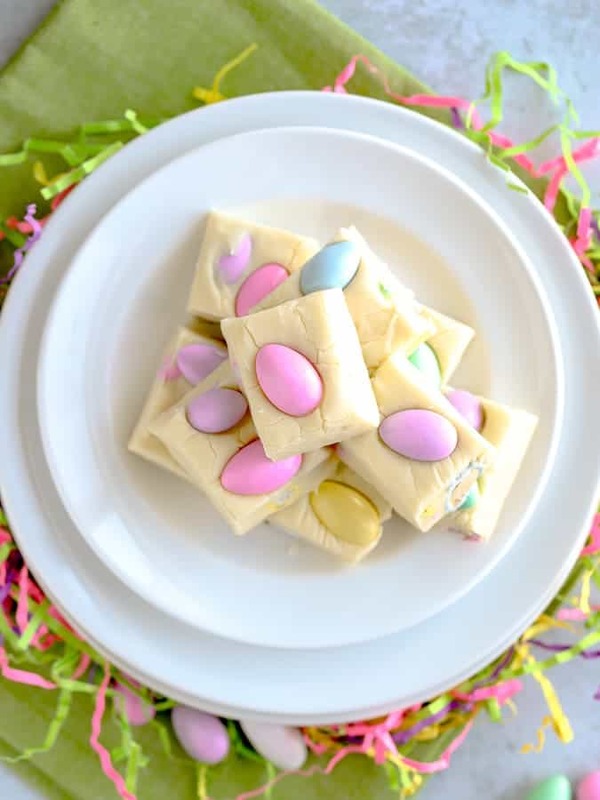 We’ll lighten the colors and make a pretty, white and pastel Easter dessert with white fudge. Festive Jordan almonds provide spring hues of pink, violet, light blue, light green and yellow. 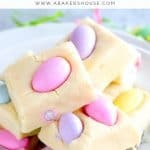 Jordan almonds look like little Easter eggs nestled into the fudge which makes it a perfect sweet bite for your Easter dessert buffet. The process of making microwave fudge couldn’t be easier. Sweetened condensed milk is the key to this creamy fudge recipe. Sweetened condensed milk is simply milk and sugar. All of my ingredients in this three ingredient fudge are from Sprouts Farmers Market. Only three ingredients! I shop at Sprouts for their affordable prices and great selection. 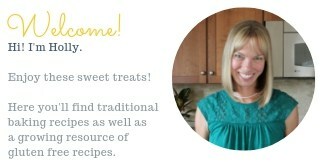 Creating recipes with their products for every day meals and for special occasions is part of my weekly routine. Melt the sweetened condensed milk and the white chocolate chips. Fold in any add-ins. 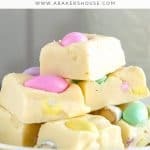 We use Jordan almonds for Easter fudge. Pour into a 8 by 8 pan lined with aluminum foil. Jordan almonds are candy coated almonds. Traditionally these pastel candies have been used as wedding favors. Pastel colors like yellow, green, pink, blue and light purple are the usual coatings but these almonds can come in any color. Their egg shape is perfect for Easter desserts too. The outer coating is a hard candy coating so be ready for a crunchy bite! The added texture pairs well with this creamy white chocolate fudge. White chocolate is typically not considered to be real chocolate. While it does contain cocoa butter, white chocolate doesn’t have chocolate solids and is not the same as chocolate. Technical definitions aside, many companies sell white chocolate in the bar or chip form. When making a recipe with a short ingredient list (like this fudge) it’s important to use high quality ingredients. Find white chips or vanilla chips that you like to eat plain because the flavor of the chips is a prominent taste in your fudge. I love making fudge and especially like this fast microwave version. Fudge is a lovely homemade gift any time of the year! 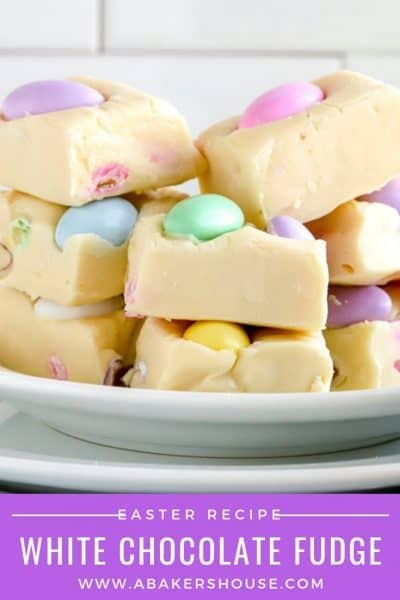 For more Easter fudge suggestions, try mixing in jelly beans or dried berries. At Christmastime you can’t go wrong with chocolate fudge or fudge with dried cherries. And any time you can enjoy the flavors of chocolate peanut butter fudge or cookie butter fudge! Pin with me! 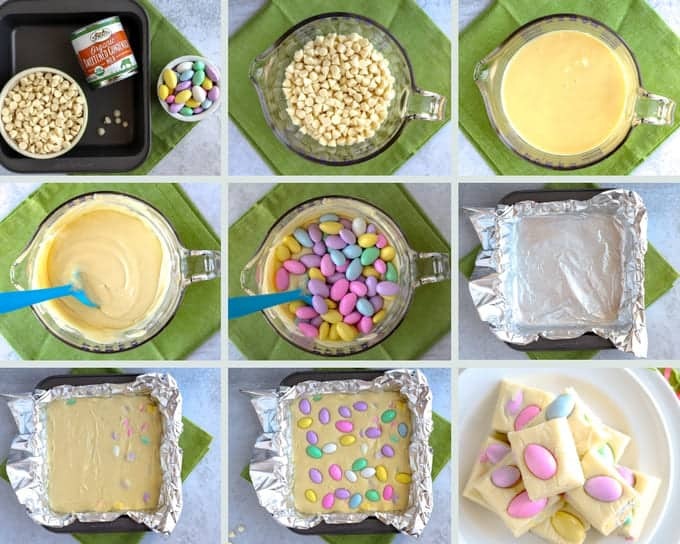 Save this Easter dessert on Pinterest! 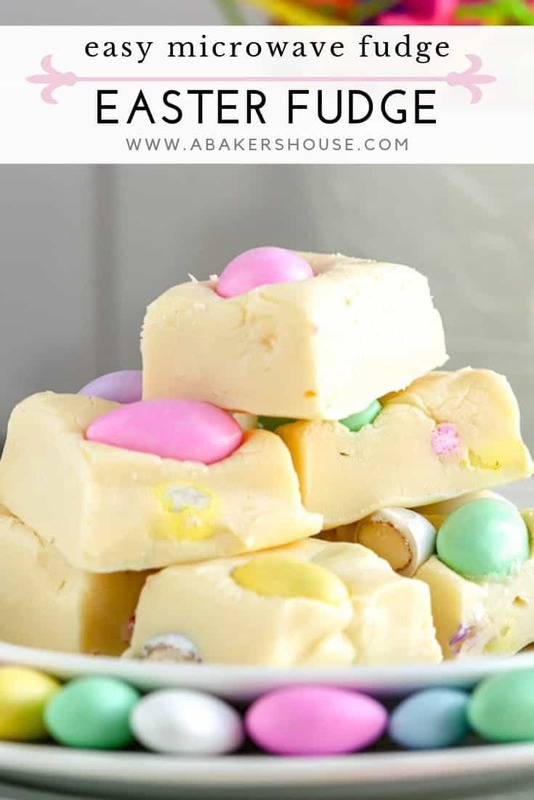 Easter white chocolate fudge is quick and easy to make with this microwave white fudge recipe! Only three ingredients and 5 minutes of active prep time are needed to create this festive no bake spring treat. 1. 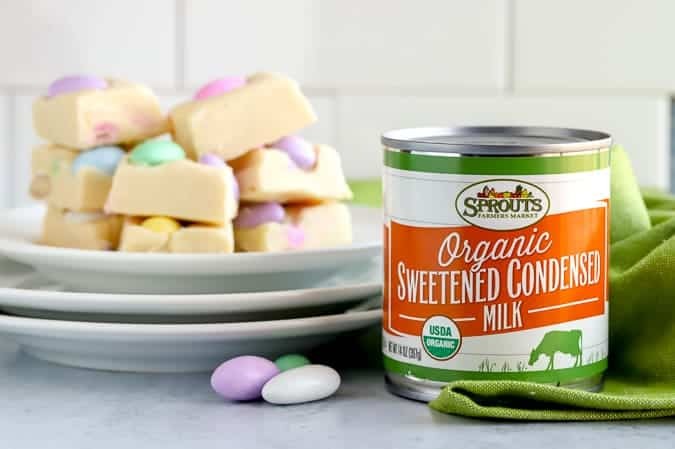 Pour Sprouts organic sweetened condensed milk and the white chocolate chips into a microwave safe bowl. Microwave on high for one minute. Stir. If the chips are not melted yet, microwave again for 30 seconds and stir again. 2. Fold in the Jordan almonds, reserving about 10-15 almonds for the top. 3. Line an 8 by 8 pan with aluminum foil. Spray with baking spray. Pour in the melted fudge mixture. Top with the remaining Jordan almonds. 4. Refrigerate for at least 2 hours or until firm. Cut into squares and enjoy! 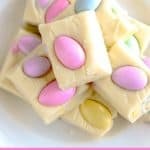 I just love how pretty Easter recipes are! Easy fudge is a great treat and no one has to know how easy it is. Love the look of the almonds. I find those hard to resist!